To those who find our politicians remote and unfeeling, today's discourse at Holyrood would have come as a counterpoise. We learned much, en passant, about the youthful life of our own first minister. Was it full of fun and frivolity, I hear you ask. Was it one frantic whirl of parties and riotous jollity? Friends, it was not. Forget Trainspotting. Think plane spotting. It all started when Nicola Sturgeon reminisced that her mum is from Prestwick. Apparently, the junior Sturgeon used to sit gazing out of the window at the sundry flights arriving and departing from the nearby airport. As she readily conceded, scarcely the life exciting. But one must derive entertainment where one can. Perhaps aware that she had strayed rather too far into all her yesterdays, she then noted that any grief she would get from MSPs was as nothing compared to the rebuke awaiting her from her mum. And what prompted all this? 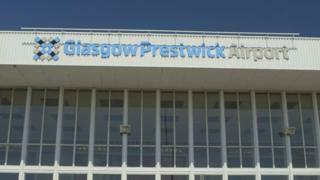 Ms Sturgeon was invited by Patrick Harvie of the Greens to comment on claims that ministers had helped Prestwick Airport tout for business from the US Air Force, current proprietor Trump, D.
The story, she declared, was "bunkum". There had been no governmental engagement on Prestwick with The Donald, either in his present position of power or in his previous occupation as a business leader with investments in Scotland, including Turnberry. Then we were off down Memory Lane again. Ms Sturgeon noted that the use of Prestwick by the US Military was nothing new. It had been happening for 80 years. Indeed, when Elvis Presley touched down in the UK, it was on a US Airforce plane. In Prestwick. En route from his military service in Germany. Ms Sturgeon, alas, was born ten years too late to witness that landing from the comfort of her domestic viewing platform. But, plainly, the touch-down by the King is part of the collective memory for Ayrshire folk. And Mr Harvie? He seemed mightily unimpressed with these tales of the youthful Nicola. He accused her of ignoring an important issue and demanded full disclosure. Already done, said the FM. The story was based upon Freedom of Information publications from the Scottish government and others. Earlier, Ms Sturgeon was questioned closely over the issue of Police Scotland. For the Tories, Ruth Davidson noted that the head of the Scottish Police Authority is appointed by the Scottish government. Decidedly too cosy, she suggested. In essence, her argument was "quis custodiet ipsos custodes", who should guard the guardians themselves. It is the responsibility of the SPA and its new chair Susan Deacon to hold the chief constable to account. With some vigour, Ms Davidson - who has pursed this topic with commendable persistence - said that the head of the SPA should be appointed by parliament, not government. In response, Ms Sturgeon indicated she was willing to look at that. For the future. For now, she argued that Prof Deacon was doing "an excellent job" and it was important to back her. For Labour, Richard Leonard mustered a sustained argument about the damage which he felt the whole affair had done to policing. Indeed, he suggested the service was in crisis. It was a rather effective performance. All the better in that the Labour leader was introduced as "Richard Lochhead" by the Presiding Officer. Mr Leonard smiled, in no way disconcerted.